Hi friends! I'm checking in this morning with a refreshing kombucha in hand, and feeling (relatively) ready to tackle this week! Sidenote – if you’re reading and happen to be free this upcoming Thursday, check out the event that my friend Becky and I are hosting for the launch of our baby - the Detox & Chill podcast!! We’d love to see you there, so check out the link here if you'd like to come! 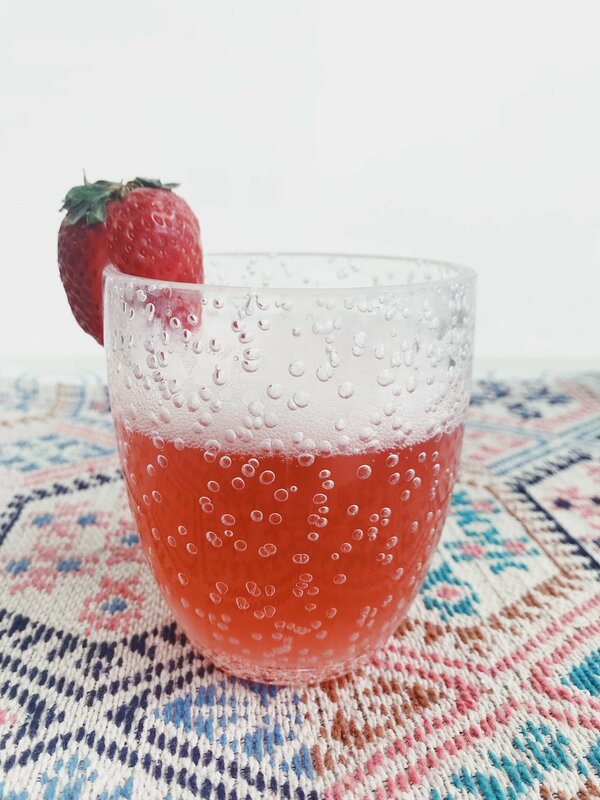 Today I’m back with a fun, summery cocktail recipe! And of course, I had to make it just a little bit healthy. I don’t know about you guys, but it FINALLY feels like it's summer, after what felt like the LONGEST winter in Boston. What better way to celebrate than with a refreshing cocktail in hand, outside on the porch? I love this recipe because it’s just as delicious as a mocktail if you’re just not feeling the alcohol. I’ve know talked about it before, but kombucha has so many amazing gut-health benefits. Because kombucha is made through a fermentation process, it is chock-full of healthy bacteria for your gut – probiotics. These healthy bacteria line your digestive tract and support your immune system by absorbing nutrients and fighting off infection and illness. As someone who has struggled with both SIBO and digestive issues in the past, I can honestly say that I've noticed a HUGE difference in my gut-health since I’ve started to incorporate kombucha into my daily diet. I was inspired to make a cocktail incorporating this awesome tummy-friendly beverage.. check out the recipe below! Simply add equal parts kombucha, Spindrift, Prosecco -- And if it's been that kind of week, a shot of your favorite liquor! Garnish with the strawberry. This weekend I drank this with just the kombucha and Spindrift, and it was still a refreshing and delicious treat. Let me know if you try this recipe, or what your favorite summer cocktail is below! I'm always looking for inspiration :).